Majority of social media managers know that there is no general recommendation concerning the time to post on Facebook. On the contrary, every brand should determine its hours, adequate to the target group and its habits. The latter can change according to new campaigns or changes of Facebook’s settings. Sotrender will help you understand the habits of your brand’s customers and make your post engage more users. High or middle school students use Facebook in different time than young parents. The habits of university graduates differ from the ones of the older. They are affected by daily routines of the users connected with particular pages. 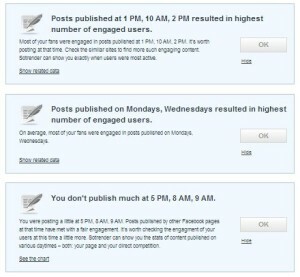 If a social media moderator consistently add posts at a given hour, after some time fans of the page start to expect new content at this exact time. What is more, fans’ activity is subordinated also to external events such as series broadcasting and tv programs or sports transmissions. It is also worth taking into consideration especially when they’re connected with the brand by commercials or sponsorship. When your fans are active? Fans of particular pages can differ significantly as far as their age and origin are concerned. Different social groups use Facebook on different days and hours. 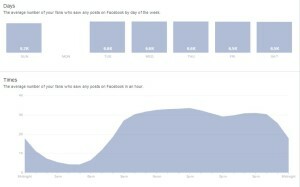 The latest Facebook Insights provide you with the information about how many fans of a given page saw a published post at the particular moment. However, the information that many fans of the profile saw the post doesn’t translate into real benefits for the brand itself. Because of that Sotrender indicates the hours during which brand’s fans are the most active, i.e. engage in the highest number of interactions. Posting at that time increases the chance for the post to be seen by more users who will engage within the page by liking, commenting or sharing the content. In order to see detailed data regarding the hours of fans’ activity, you have to click on the “Engagement” bookmark. This way you will get access to the data showing the engagement divided by days and hours. Similar kind of data is also available in bookmarks devoted to the “Types of activities” and “Interactivity Index”. In the bookmark “Types of activities” you can check out which moment our fans published the majority of comments, when they shared the content most frequently and when they choose to “Like” it. Additionally, by clicking on the “Types of activities” bookmark, and then on the botom bar below the chart, you can modify its content so that it shows only the activities that are of our interest. 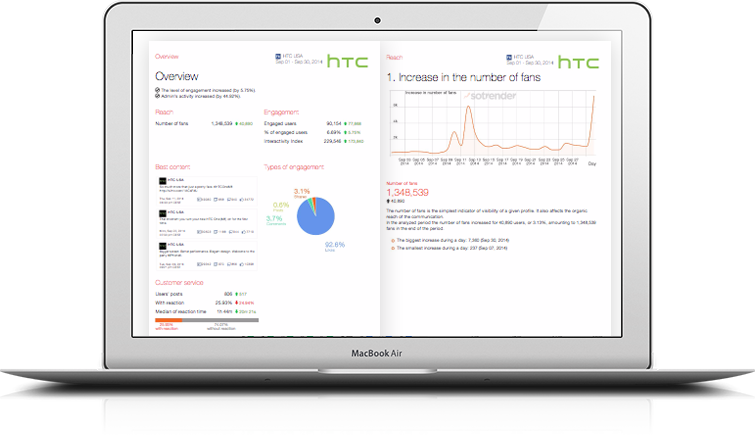 How can we use the knowledge about the time of fans activity gained thanks to Sotrender? Knowing at which days and time they are most active and what activities they perform, we can optimize and adjust our communications to the time at which the highest number of people are present on Facebook so that our post reaches more users. How can we use the knowledge about the time of fans activity gained thanks to Sotrender? Knowig at which days and time they are most active and what activities they perform, we can optimize and adjust our communications to the time at which the highest number of people are present on Facebook so that our post reaches more users. For example, if we see that most users engage within the site about 16, it is worth intensifying the activities on that hour. It works similarly with days of the week. Although Facebook’s golden rule is to add new content every day, seeing that posts engage more fans on Thursdays, it is advised to move the information about new offers or promotion to that day. It is also worth reflecting why fans are active at particular time. Maybe their activity is connected with some tv show transmission? Sotrender monitors also the activity of administrators and shows when he/she adds new content or not. Knowing all that it is also advised to check other times when the users engage in the activities not provoked by the administrator i.e. early morning or late night hours. When it turns out that at this time most of our fans are active, maybe it is worth to change work hours of administrator? In order to fully use the knowledge provided by Sotrender, you don’t have to be an expert in charts’ analyzing. We wanted to save time of our users, so we introduced a new functionality to it – i.e. automatic tips which work on the basis of data-mining algorithms. The tips will help in data analysis, providing you with valuable pieces of advice ready to implement into practice in order to communicate more effectively. Thanks to the Tips, you will know not only when your fans are most active and when it is the best to publish, but we will also tell you at what hour you should try publishing to increase the engagement.